While working in my vegetable garden, I accidentally disturbed a bumblebee colony. The colony is in a mound of dirt that I wanted to remove to make a path into my garden. 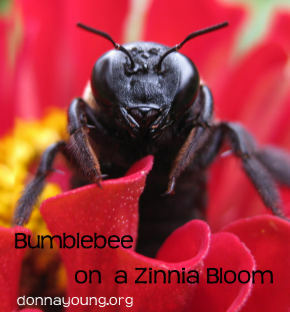 I dug once in the ground with a hand trowel and bumblebees scattered. I went inside the house. Later I returned to the dirt mound and saw what I had done. I had unearthed the nest with one stroke and by this time, the bumblebees were on the exposed nest doing whatever bumblebees do. They no longer seemed bothered by my proximity and I took a short video of them. A couple of the bumblebees are fanning the nest. 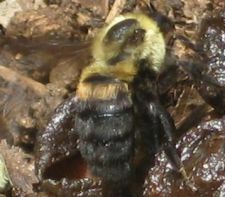 Bumblebees are valued as pollen carriers and I had exposed a nest. I didn't know what to do, so for now, I've covered the nest with a 3 gallon planter that has drainage holes large enough for the bumblebees and they are able to climb under the pot because it sits on uneven dirt. The next day I looked under the pot and the bumblebees were still on the nest. I suppose at least the nest will stay dry and warm enough. I will not bother them any further. Since placing the planter upside down on top of the nest, I have looked one more time and discovered that the bumblebees are still living at the site and they have buried the nest. 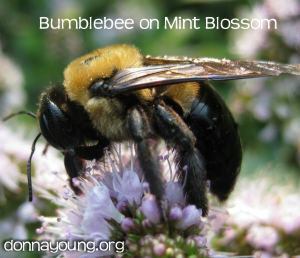 As I looked, bumblebees began to emerge from the ground, so I lowered the planter. A couple of months later, the planter is completely covered with mint, morning glory and some other weeds. This is a very brief write-up of the essential parts of an insect drawing.